One of our favorite restaurants, Sweet Grass Grill in Tarrytown, New York, serves buffalo tempeh “wings” as an appetizer. THEY ARE SO GOOD. Each time we order them, our server reminds us that they don’t contain chicken. We don’t care! We love them! Give us more! 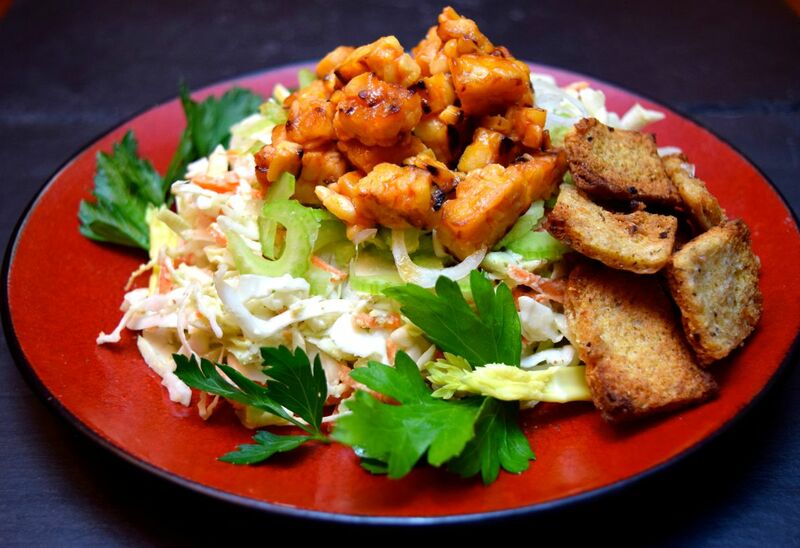 So imagine my intense curiosity when I saw this buffalo ranch salad recipe featuring buffalo-ized tempeh or tofu in Salad Samurai: 100 Cutting-Edge, Ultra-Hearty, Easy-to-Make Salads You Don’t Have to Be Vegan to Love. You know, sometimes I just like to try things to see if they work. This works! It totally delivers the spicy, vinegary buffalo flavor, as well as a creamy pesto ranch dressing, without any animal products. And there’s the question of that creamy pesto ranch dressing. How is this achieved without dairy, you ask? Raw cashews soaked until soft and blended with all kinds of good stuff. That’s how. I know, it’s crazy. But in fact it’s a fairly common practice to use cashews for creamy stuff in the vegan world (which I only dabble in). OK with me! I live in New York state, so I know there are a lot of opinions about buffalo wings out there, but for my money, the hot sauce that delivers the true buffalo wing flavor is Frank’s Red Hot. Frank’s is what was originally used to make ’em. Plus, it’s good! I tend to shy away from hot sauce that has only one dominant flavor such as HOT or VINEGAR. Frank’s has a nice balance of both. You have to eat a lot of Frank’s before you can’t feel your lips any more, which in my opinion is a plus, but if you really want to make these hotter, you could probably make these buffalo morsels more “atomic” or hot by adding your favorite even-hotter sauce to a solid base of Frank’s. I’ll leave that to you. If you’re not familiar with tempeh, it is a soy-based protein with a slightly nutty flavor and a chewy texture. Here is a great explanation of tempeh and tofu. And if you love this, here’s another recipe I made from Salad Samurai. I’m loving this fun and healthy cookbook, perfect for summer! Equipment: Baking sheet, parchment paper or aluminum foil for making the garlic croutons. Wok or cast-iron skiillet for searing the tempeh or tofu. Soak your cashews: Place your cashews in a bowl with the hot water and soak for 30 minutes while you prepare other elements. Make the croutons: Preheat oven to 350 degrees F. Line a baking sheet with parchment paper or aluminum foil. Whisk together the olive oil, lemon juice, garlic, herb blend, and salt to make dressing for the croutons. Pile the bread cubes on your baking sheet, pour the dressing over them, and use your hands to toss until evenly coated. Spread in a single layer on the baking sheet, and bake for 20-25 minutes, keeping an eye on them towards the end to make sure they don't burn. Make the dressing: Once the cashews are done soaking, pop them in a blender (I use my Ninja smoothie maker - it will fit in a smoothie cup) with the rest of the ingredients and blend away until smooth. Store in refrigerator until ready to use. Make the buffalo tempeh or tofu: In a small mixing bowl, whisk together the hot sauce, lemon juice, and agave nectar. Heat 1 T. high-heat cooking oil over high heat until hot (shimmery). Add tempeh or tofu and saute until golden brown on all sides, about 5 minutes. If using tempeh, add 2 T. water and sauté 1 more minute, or until water has been absorbed. Turn off heat and toss with hot sauce mixture. Assemble the salad: Toss the coleslaw mix with the creamy pesto ranch dressing. Plate into 2 individual portions, and top with sliced celery, buffalo tempeh or tofu, and garlic croutons. Enjoy!